Authorized Gutter Helmet Dealer - R.G. Penfield & Sons, Inc.
R.G. Penfield & Sons is the Gutter Helmet Authorized Dealer covering seven counties in our tri-state region: Franklin, Hampshire and Hampden in Massachusetts. Cheshire and Sullivan, in New Hampshire. Windham and Windsor counties in Vermont. • Gutter Helmet created and pioneered the professionally installed gutter protection industry more than twenty years ago. Since that time, Gutter Helmet has grown to be the industry innovator and leader, while imitation products come and go. • Gutter Helmet’s mission is to remain the industry leader through innovation, quality and service. Over twenty years of ongoing innovation and improvement has resulted in the granting of five U.S. patents with two more pending! • Gutter Helmet’s exclusive, multi-patented design will handle twice the heaviest rainfall ever recorded… that’s more rain-handling ability than other gutter protection systems on the market. • Gutter Helmet is the only system with the patented PermaLife™ coating that resists dirt build-up, fading, chalking and corrosive acid rain…and meets U.S. Arm y military specs! 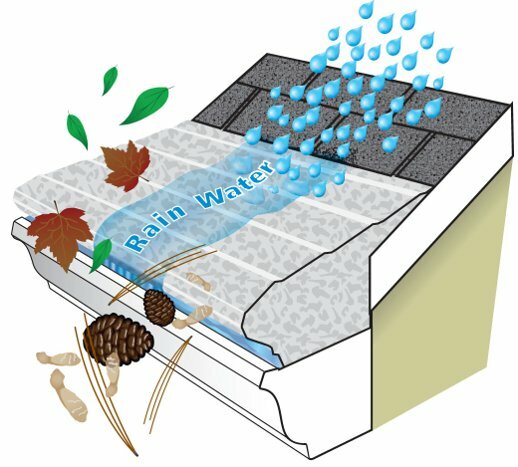 It is the only system that is manufactured with a patented metal texturing process that increases the measurable thickness and strength of every panel, while reducing weight and stress, AND increases surface tension (performance) over similar smooth products (every other competitor); features a patented nose-forward design (with NO vertical openings) to keeps leaves and debris out of the gutter; and features patented flow-limiting ribs that strengthens the system and causes rainfall to slow and sheet. • Gutter Helmet is the only system that offers professional installers a choice of three different reinforced .048” support brackets to handle any homeowner need and can withstand the deepest snowfalls (U.S. patent #4,497,146; 4,796,390; and 5,819,476). Other products weaken and add stress to gutter supports by exerting a constant downward and outward pressure. • Gutter Helmet and R.G. Penfield & Sons, Inc., as its professional dealer, provide a Lifetime, Transferable Warranty. • Gutter Helmet is manufactured and backed by Southeastern Metals Manufacturing Co. (SEMCO), a Gibraltar Industries, Inc. company. Gibraltar Industries is a leading manufacturer, processor, and distributor of metals and other engineered materials for industrial markets. The #1 Gutter Protection System in the World. The days of dangerous climbs are over! Fact: Over 80 million feet of Gutter Helmet has been professionally installed. That’s more retrofit gutter protection systems than all of the competition! Any competitor’s claims to be #1 are false and misleading. Only Gutter Helmet can rightfully claim to be the #1 gutter protection system. Fact: Since Gutter Helmet was introduced more than 25 years ago, hundreds of thousands of safe and satisfied homeowners have joined the Gutter Helmet family! That’s why Gutter Helmet stands alone as The First. The Best. The #1 Gutter Protection System in the World!